Robert: No way, I’d be the biggest loss. Bryan: That’s not true at all, Lorenzo would be the biggest loss. Lorenzo: You’re not going to fight for yourself? Bryan: No why would I, we all know I’m not important. Bryan: Am I though? They only put me in when we’re losing by a lot. They don’t even trust me with a 10-run lead anymore after the incident. Garry: We shall never speak of the incident Bryan. Lorenzo: Which one, the one where he gave up 9 runs and then walked off the field? Jason: You all really know how to change the topic don’t you. I was saying I’d be the biggest loss because without me, who would play center bench? Garry: I’m sure we could make a few adjustments. Eli: Is my job in jeopardy coach? Garry: No, you’ll remain right-center bench as long as you stay on the team. Eli: I don’t know coach, I heard there are talks of them trading me. Robert: Yeah Eli, I also heard they were looking for some more popcorn for the clubhouse. Eli: That’s the rumor. I’d be honored to leave the team as part of that trade. Lorenzo: How much popcorn are we talking? Eli: I heard an unlimited supply. Lorenzo: I’m in. Alright Eli how do we get you off the team? Eli: You’d do that for me? Thanks Lorenzo! Robert: Yeah, thanks Lorenzo for looking out for yourself. Lorenzo: I take pride in it. Robert: And as I was trying to say, I really do think I would be the biggest loss for this team. Robert: Why do I always need a reason for everything? Just because. Garry: OK so that settles it, we could do without Robert, Bryan, and Lorenzo, and we have nothing to lose if they trade Eli. Lorenzo: You really think you can make it an entire year without me? Garry: Is that a question? Lorenzo: Alright, let me take you through a scenario where I wasn’t there. 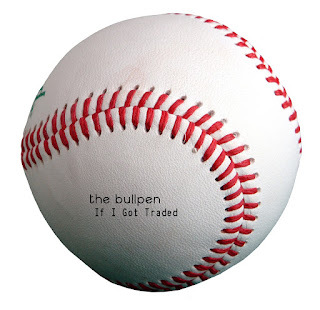 This is how the 2019 bullpen would look like. Eli: Wow, I really miss Lorenzo. Garry: Wow Lorenzo, quite the story there. Jason: You realize I’m not that dramatic right? Lorenzo: It’s just a story, who cares who says what? Kurt: Can we all just agree that I’m the only person who would hurt the team if I left? Kurt: I get paid more money than everyone else. Garry: OK, so you’re more expensive for doing the same thing everyone else does...and wait how do you make more? Garry: OK doesn’t sound shady at all. Kurt: I may have threatened to come out with a memoir about how much we’re underfunded by the team. Garry: We’re not underfunded by the team, we just don’t use what they gave us. Kurt: And? We could get people to believe it. Garry: So now we know if we want pay raises we just have to make up mini-scandals about our own team, got it. Robert: Anyone have any ideas? Garry: Do we not know how to stay on a topic for more than 10 seconds? Bryan: Apparently not. I’m going to call up management right now, they’ll tell us what’s going on and we’ll settle who’s the most valuable person to the team. Bryan: No one’s going to stop me? Jason: You don’t know their number do you? Bryan: You were supposed to all come to the conclusion that we’re all important in our own unique ways. Garry: That’s a bunch of crap, you’re all benchwarmers and I have the easiest job in the world. One thing is for sure, you all are useless and won’t even pitch at all next season. Sally (on the phone): Pete! How’s our favorite General Manager doing? Mike: So what are we thinking for offseason trades, Pete? Pete: Well our starting pitchers are really good, but to keep some of them we would have to pay more money than we could afford. That’s why I’m going through with a plan of trading some of them for some prospects and using the guys in the bullpen a bit more. Mike: Pete, with all due respect that sounds like a terrible idea to me. Pete: I guess they’ll have their work cut out for them.